Finding the right electronic drum set isn’t easy. There are questions about the module, the pads and how to connect this thing to a computer. 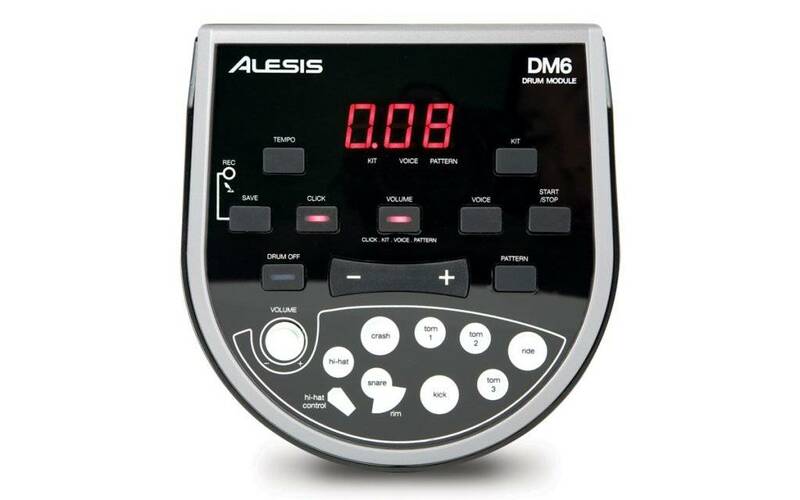 I’ve searched and searched the web for all the questions about the DM6 – and compiled the answers in this Alesis DM6 review. So jump to what’s relevant to you or read it all through. I’m confident you’ll get your questions answered. What about Rock Band for Playstation or Xbox? 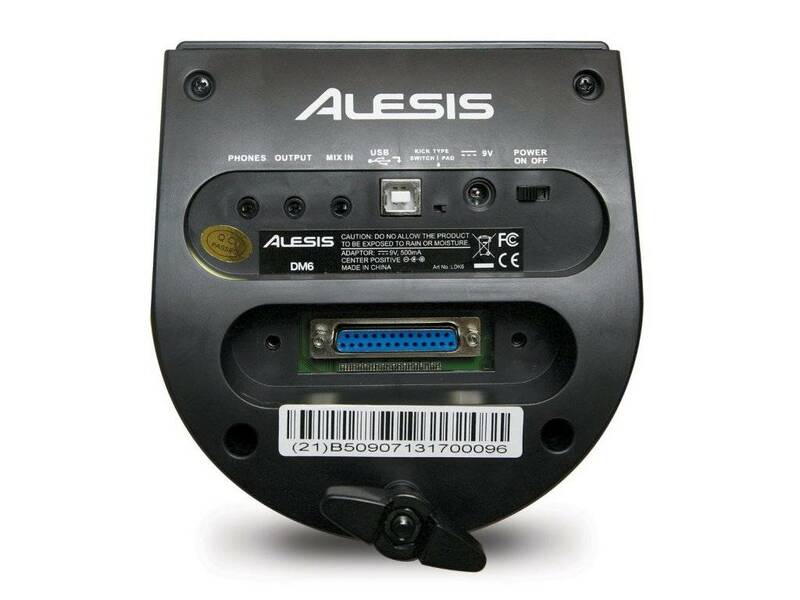 In my view, the Alesis DM6 is was the cheapest useful electronic drum kit on the market – until early 2016. For back then, Alesis launched the DM6’s successor – the Alesis Nitro – and I think they’ve made this new model even better than the DM6. So before reading on, I recommend you check out the differences between the Alesis DM6 and Alesis Nitro here. To my mind, there’s no good reason to do so. Both the Alesis Nitro and the Alesis DM6 have the same pad sizes and you’ve just read that the Nitro module is much better in terms of sound range, learning functionality and opportunities to expand the kit. If you bought this kit on Amazon like I did, it would come in one box of about 3 x 2 x 1ft and weigh around 35 pounds. Update: the DM6 is no longer available on Amazon, but the box sizes shouldn’t vary much when buying here. Inside that box are 8 drum pads: 1 dual-zone snare pad (for regular hits and rim sounds), 3 single-zone tom pads, 1 kick pad and 3 cymbal pads. The box also includes the stand (or “rack”) and a 110 Volts AC adapter, and you’d also get a pair of sticks (cheap ones of course) and even a cheap, but solid, bass drum pedal. If you’d rather let your surroundings hear that you’re playing drums, you can also go for any kind of amp (guitar, bass or keyboard), or use you band’s PA via a sound board. And in case anything’s not in the box or broken: the DM6 comes with a one-year warranty against manufacturers defects. Operating the Alesis DM6 module is very simple and I think that’s a good thing for you as a beginner. Whether it’s changing the volume of the individual pads in the lower half, switiching on the click or the recording function: all works at the push of one or two buttons. And they are labelled very clearly. The DM6 module contains 108 different sound (Alesis calls it “voices”) ranging from various versions of kick, snare, tom and cymbals sound over Timbales, Congas and Cowbells all the way to some DJ sounds (see overview here). Out of these 108 sounds, Alesis has constructed 10 preset kits (Rock, Pop, Jazz, Latin, DJ etc.) 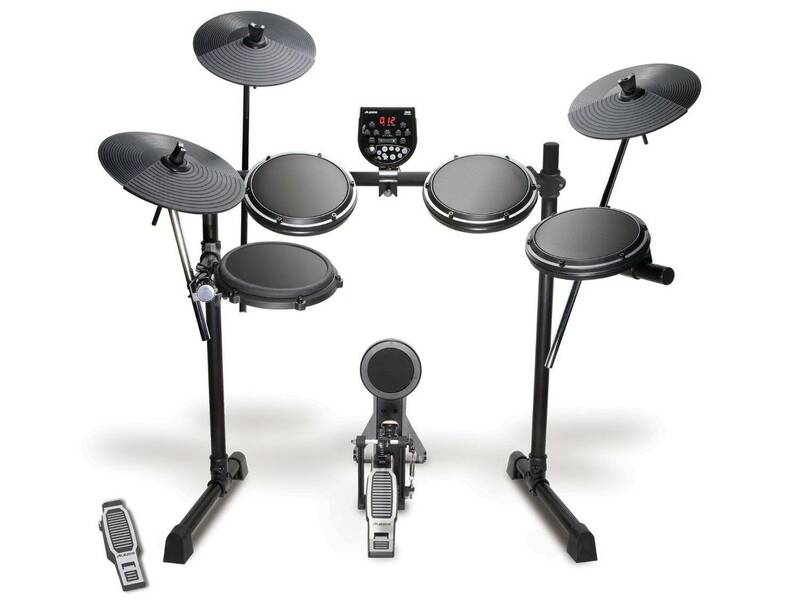 and provided 5 slots for you to put together your own drum sets. Want to give the presets a listen? I have absolutely nothing to complain about in terms of sound. Considering the price, the Alesis DM6 does sound really good. Then you can record what you’re playing into a recording software like Reaper (free) or any paid option out there (Addictive Drums, Ableton, Garage Band etc.). From this point onwards your DM6 is no longer a drum set, but it’s a MIDI controller. Meaning: when hitting a pad you can trigger any sound that’s stored in your software’s sound library. That’s what I think is the DM6’s main purpose: being a practice kit. And while it does that well, the DM6 hasn’t got any of the motivational training functions of a Yamaha DTX450K or Roland TD 11 on board. But to be fair: the DM6 only costs half / one third of those kits. Still, the DM6 allows you to do the most motivating thing I know, and that is playing along to some Foo Fighter’s songs (or any band of your taste). You have to get a 1/8 inch audio cable separately again, but with it you just plug your iPod, iPad, mp3-player or whatever into the Mix-In input at the back of the module and off you rock. And whether you’re playing over headphones or an amp: you will hear both the original track and your own drumming. And you can adjust the volume of the latter via the knob on the module. The DM6, like most other electronic drum kits, has pads made of rubber (with a steel core). Playing them will feel much like playing a practice pad. I don’t see this as a negative, but I know some people want playing electronic drums to feel like playing acoustic ones. If you’re one of them, you’re cheapest option is to invest around 800$+ dollars and get the Alesis DM10 with mesh heads (see my review here). I put a carpet underneath my kick pedal, because its vibrations transmitted especially well into the room underneath. As for the pad’s sound features: the snare pad is quite finey tuned, so that it can even register very quiet strokes (so-called “ghost notes”). You can open and close the Hi-Hat, but you cannot get a half-opened Hi-Hat sound. Again: no problem for me, but you have to chose yourself. Also, the cymbals have no choke funtions like those of pricier kits have. Since many customers wanted to add a tom or cymbal to the DM6, Alesis manufactured an expansion cable snake with two more trigger inputs. So now you can actually add two pads (1 cymbal, 1 tom). And in case you want to use your double bass pedal with the DM6 you need not add anything. The kick pad is about 3 inch wide and that will accomodate most double bass pedals. Don’t worry about assembling the DM6. It’s easy (9 steps) and there are how-to videos to assist you too. Once set up, the Alesis DM6 will take up an area of about 5ft by 4ft. And you can of course fold it in order to store it away. You’ll have to loosen 15 nuts or so, which can be done fairly quickly, but I wouldn’t recommend doing this on a daily basis. I purchases the DM6 set and like it except when I hit the ride it rings like a bell. Not a cow but a ding as in dingdong anybody home? read a few things here and there about a fix but haven’t found one yet any suggestions? If not, just contact me again. You can’t install other kits on the DM6, you can only change the ones that are stored in the module already. For step-by-step instructions on how to do it, please see page 2 of the manual here. How to update the firmware is explained well here. Can i make the hi hat pedal changes into a second kick pedal?? You can only do the when using the DM6 as a MIDI trigger – i.e. when connected to your computer and running in a software. Otherwise, you’d have to expand a little like explained here. Great review, extremely helpful as i’m a guitar player who just wants something to mess around with and enjoy, without taking up the space of an acoustic kit. At this point you can pick one up on craigslist very cheap. My key thing was being able to use a double bass pedal. Thank you for taking the time to post this. Thanks, Jim. I highly appreciate your feedback! Hi Thanks for a great review. I recently got one I’m am a beginner do you think it will do good for me and the sound quality decent? Please do let me know about your impression once you’ve tested it! Great review!! Thank you so much for your time and it was very helpful for me. I learned a lot reading this review. I recently got one and I love it. I’m a beginner and this DM6 meets my expectations. I have a question, what kind of apps (iOS) do you recommend for a beginner? Actually I only use the Soundbrenner App as a metronome (the article talks about their paid wearable too – but the app is free and can be used on its own. Other than that I haven’t found an app that really convinced me to stick with it (I haven’t searched far and wide though). But I guess your question aims at how to go about learning the drums properly? In that case, I’d recommend you check out Drumeo – my go-to online lesson platform. Thank YOU, Dorothy! It’s my pleasure! Great review. Im building a diy kit from acoustic drum set. Im wondering if this drum module would fit the bill? Thanks so much, Rene! This is a little hard to say, since I don’t know what you’re looking for in terms of a drum module. I can’t even find an option to buy a separate DM6 module online. Regardless, I would recommend you check out the Alesis Nitro module – it has more sounds and presets and the whole kit is cheaper than the DM6. a late bloomer when comes to drums. luv the kit. 299 when bought. thanks for what u do!! I have the DM6 Nitro kit which has the DM7x module. Just added a chokeable crash to the kit. it’s a 10 inch instead of the kits 12 in cymbols but a non issue. 39 bucks new. info anywhere on dm7x module. do u know why? Great review. Am I right in thinking you only have one output to connect to a single speaker or amp (and you’ll need a 1/4 inch jack connector)? Also, I’ve found that the output is very quiet over several headphones that I’ve tried – is this your experience? Thank you – and sorry for the delay in answering! The Alesis DM6 has one line level output and another for headphones – so 2 outputs in total. And no, I’ve not faced the headphone volume issue. Which headphones are you using? Have you tried 2 different ones to make sure it’s not the headphones’ problem? I’ve used 2 pairs of Sennheiser HD 600’s and a pair of Sony phones (can’t remember the model) and they are very quiet with the Alesis. This kit is actually my sons’ and I have Roland TD-11KV’s and the same phones are fine. I thought initially that there was some kind of ‘volume limiter’ on the Alesis as they seem very quiet in the phones. Hm, strange. Could you check your headphone jacks please? Do they have 2 or 3 “rings”? hi! found an alesis dm6 set by someones trash. no foot pedal but all other pieces are there, except where does the sound come from? control panel works. do i need a special amp or…? thanks. Yes, you do need some kind of sound output device that you plug into the output on the back of the module. It can be either heaphones (see my favorite ones here) or amp (my favorites there). thank you! my headphones work great. trouble hearing myself play over the 40+ rhythms. when i turn the volume up the pattern gets louder also and the snare can barely be heard. no operation manual found in the trash, lol. any suggestions? thanks Yannick. Are these 2 different problems you’re talking about? I.e. problem #1 = you can’t hear yourself playing over the rhythms (you seem to have solved that by turning up the volume) and problem #2 = the snare is quiet? As for the second problem, this advice might help.